I love your grosbeak! It’s been strangely cold here too, but not rainy. We need rain. I so wouldn’t worry about a missed post – glad you’re not worrying! I’m thinking about taking a blog-vacation next week when I head off to hike on the AT. I’d considered trying to pre-schedule posts, but I’m not sure I feel like it! We’ll see. 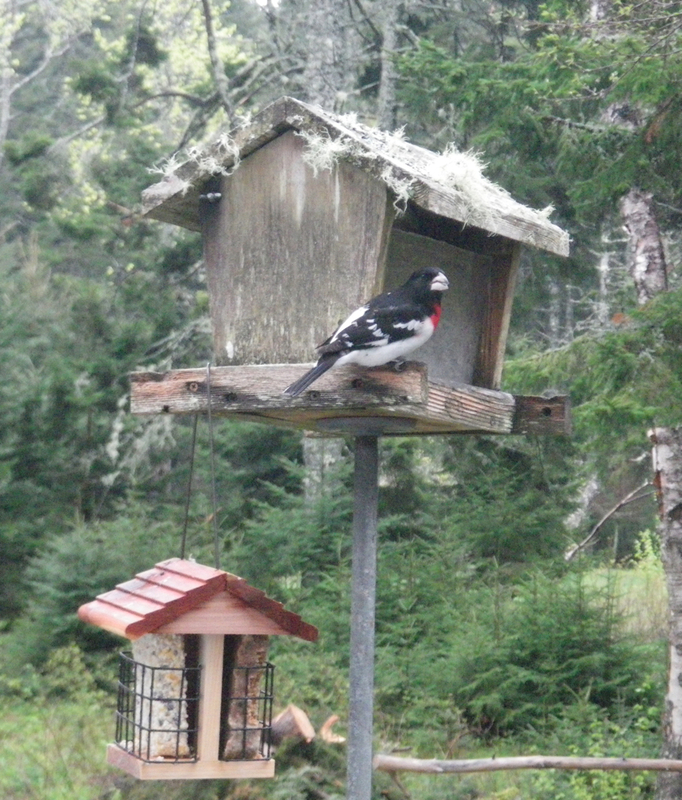 The grosbeak is excellent company. he was there today when I came home at 5. I’d send you our rain, but I wouldn’t want the mighty Miss. to carry more water as it heads your way. I always love hearing what you have to say about what you are up to. Matters very little to me if it’s everyday. 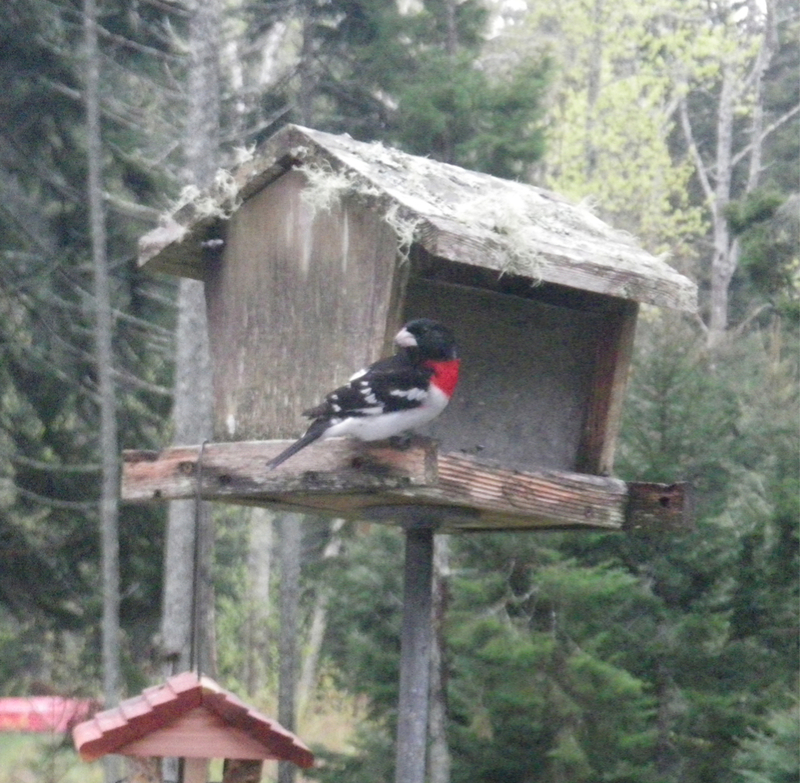 The grosbeak is gorgeous. We don’t have anything like that. And rain, over cast, wet….I wish for that right now. We have had less than 1″ of rain since October. The humidity ranges between 5-10%, everything is brown and most of my beloved plants are struggling. They are even arid climate plants. But life is like that and mother nature will do what she will. I think it is wonderful that the weather would pull you into the studio when you have your grosbeak beautiful friend outside to keep you company. It’s always good to be reminded of people who need the rain and humidity when we have so much. I can’t imagine how dry it is where you are, but it helps to know you would appreciate this weather! I hope you get some for you and your plants. When do you move? It will definitely rain when you have to load a truck!! After the most amazing April & early May here in England, it is back to ‘Typically British’ weather. Cold, dull & rainy. Some cynics say ‘That was our summer’, but I am so hoping not! We have a nesting box, hidden in the ivy just outside our dining room window, where we have Bluetits nesting. We can see the male flying in & out all day with caterpillars & grubs for the little ones. I love just sitting & watching. Our pond is full of tadpoles, which are also fun to watch, although the poor things have taken to the bottom of the pond as the temperatures here have plummeted. My daughter Hope & I leave for NY on monday morning bright & early! We are so excited & are so looking forward to catching up with Susie, before she comes up to Maine. Here’s hoping for warmer weather on both sides of the Atlantic soon!! Lynn, that nesting box sounds so cool! Will this be Hope’s first trip to N.Y.? To the U.S.? We too get people who say, “Uh oh…it’s going to be one of those summers…” We just have to take what we get and make the best of it eh? I do hope we have a beautiful September, though. Our son Robin is getting married, on the island, in the 10th. Outdoor wedding. I for one enjoy every one of your posts, but support you wholeheartedly in missing one or two along the way. I’d say the Post-a-Day challenge served its purpose. Love that bird, and hope you get some sunshine soon. You are so sweet to say that! Thank you Nancy. You are right. The Post a Day Challenge has definitely served it’s purpose. No sun yet, but the bird is back!